I often make my own sandwich spreads, and this weekend I prepared a few as fillings for my swirls. Swirls are wraps with thick filling, thinly sliced and used as canapes. This weekend I made swirls with one smoked salmon and cream cheese filling and one smoked mackerel and mayonnaise filling. 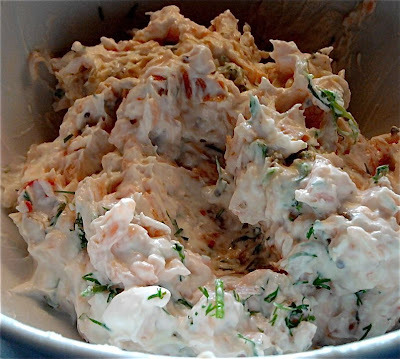 Salmon and cream cheese is an old combination, renowned from the famous Jewish salmon and lox bagels. I bought a packet of Philadelphia light cheese, sliced the salmon thinly, then chopping all slices. Then I mixed the salmon and cheese, adding sweet chili and dill weed. 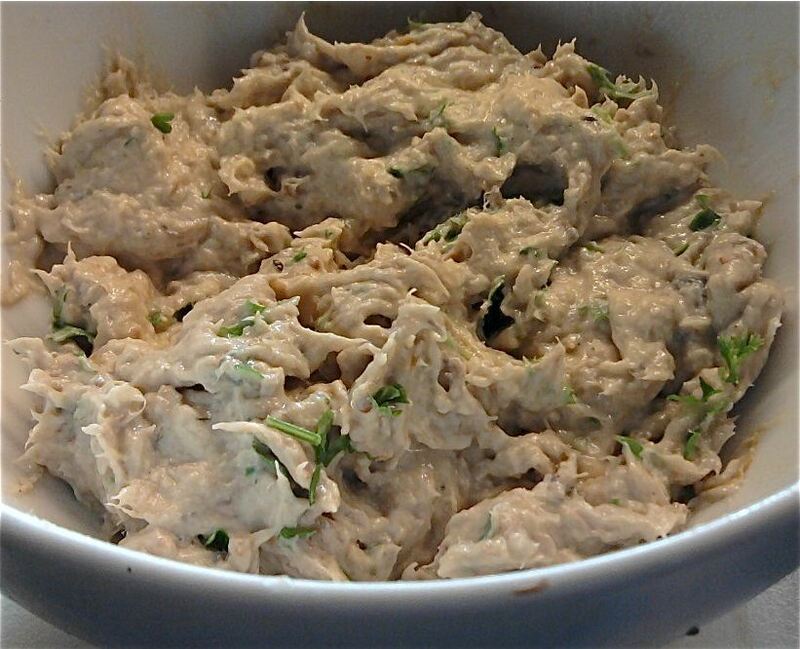 This spread may be used on bagels, rolls or as a filling in a wrap. Smoked mackerel, mayonnaise and Dijon mustard - a great sandwich spread! My brother-in-law is a keen mackerel fisher, and on a good day he can catch hundreds of them. My sister has thought out several ways to prepare such an enormous amount of fish. My brother-in-law loves to smoke them with the local fish seasoning. I had this idea that smoked mackerel might be delicious finely chopped and mixed with Hellmann's mayonnaise and Dijon mustard, and I was right. The oily fish mixed beautifully with a few tbsp of Hellmann's mayonnaise, and the best thing was that it did not seem too fat (even if it really was). Contrast was provided by the hot French mustard. Both consistency and taste reminded me of a spicy tuna salad, not a comparison out of the blue as the tuna fish is a relative of the mackerel caught in our waters. I served the spread in wraps, but I found it too runny (due to the amount of oil), to use in this way. It would, however be great served as a spread with crackers for guests to help themselves.